One day I was happily working along in the studio when I received a very exciting email from Brides Magazine! They were putting together the annual stationery special & were looking for a chic wedding suite inspired by Aspen! And thus began a super fun design process just like what we do with actual wedding clients! We brainstormed concepts, created sketches, made designs & revisions until everything was just right. 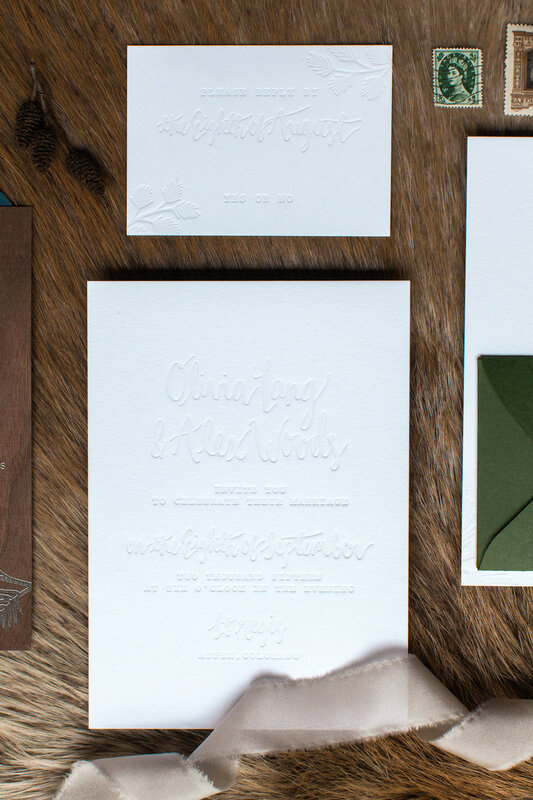 The finished product incorporated silver foil stamping on wood veneer, a blind deboss invitation, details & response cards, hand-painted response card envelopes, & linen fabric liners! We also did an alternate laser engraved wood cover! And in the end this beautiful suite was delighted to make the cut (along with this one!) and made its debut in the May issue of Brides Magazine!